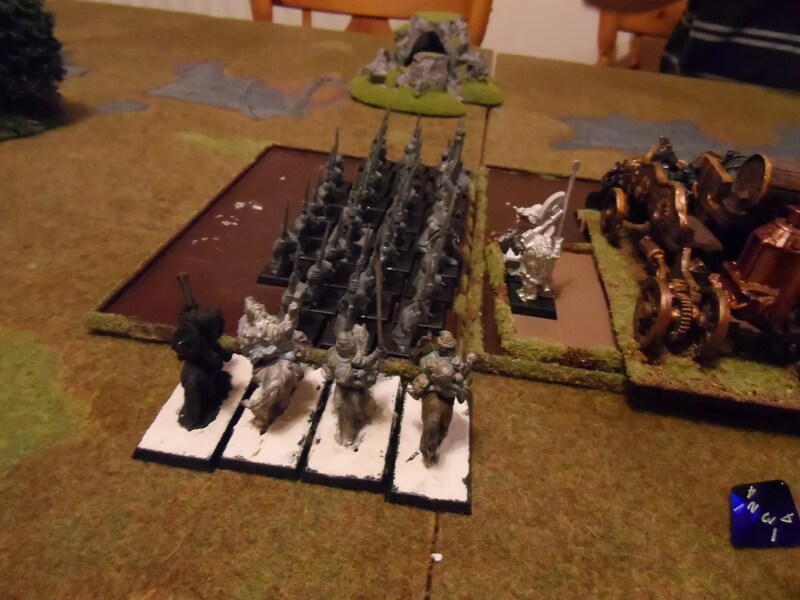 But on the right flank, the flank guard defeated the Orc Wolf Riders and faced off against the Night Goblin Archers, who had also been reduced in numbers due to the Rangerererers. 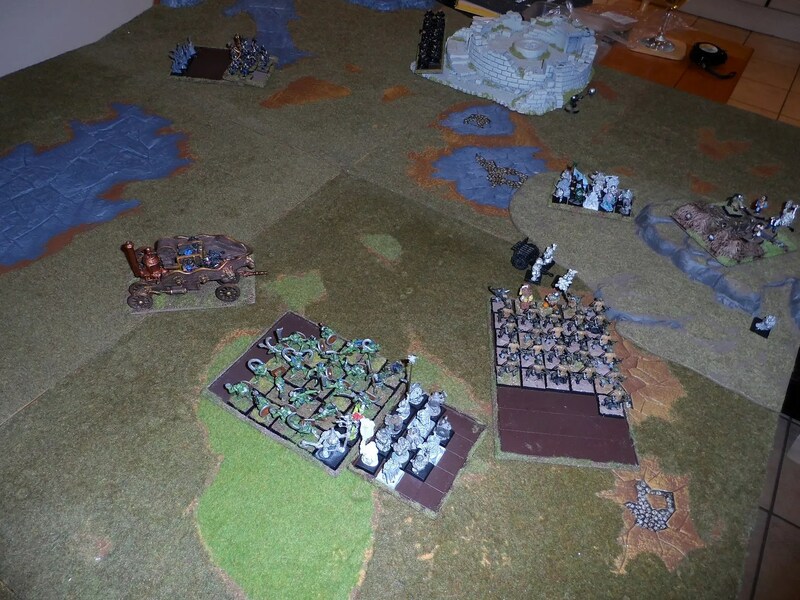 The Black Orcs caved in against the Steam Juggernaut, and the Pony Express flank charged the Night Goblins. And the Dwarves won the combat and ran down the Night Goblins and the Black Orcs, destroying the BSB – something which we often forget about. Lone Night Goblin Fanatic whirling around on his own ! The Dwarf Flank Guard unit broke the Night Goblin archers but failed to catch them but pursued them across the battlefield. But the game was not over. 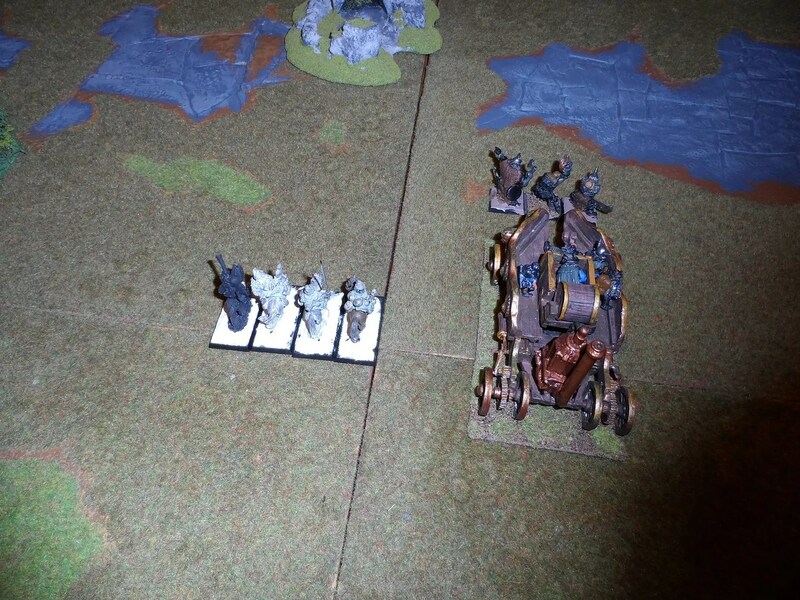 Having destroyed the Dragon Guard, Harboth’s unit turned andran down the Organ Gun, but not before they held them up for a round so that my General Shambles’ unit of Quarrelrerers turned to face them. Meanwhile the Warriorererers under One Eyed Sally held up the Savage Orcs, made them lose combat (and Frenzy) and ground them down. 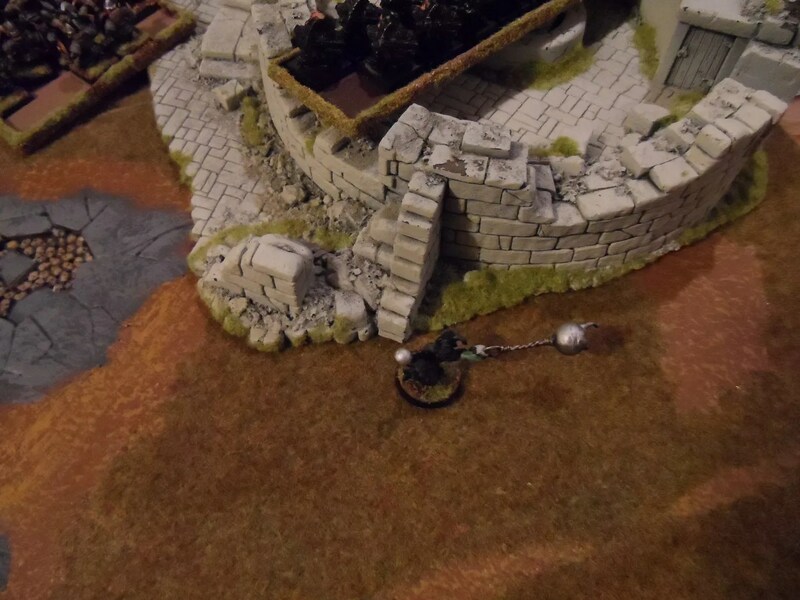 Shambles and Harboth faced off and attacked each other, whilst the Steam Juggernaut flank charged harboth’s and the combination defeated Harbpoth’s. 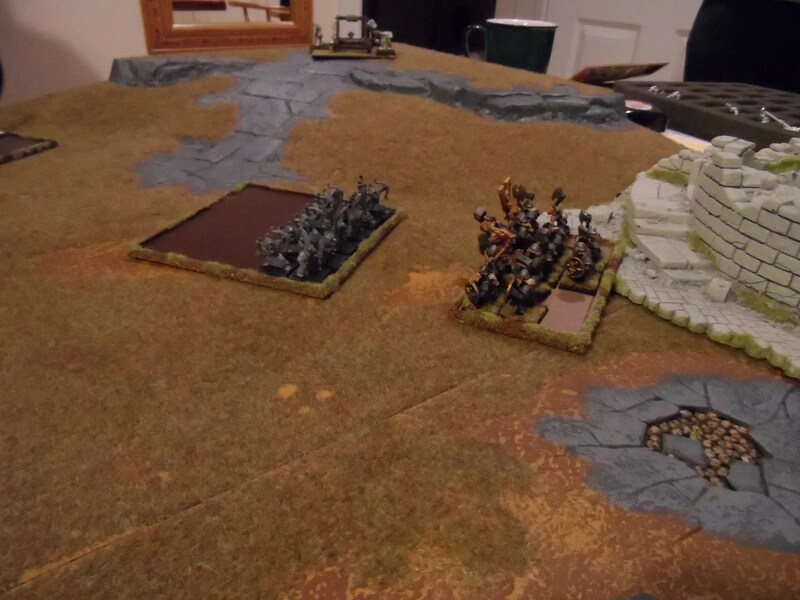 The other combat, with the Savage Orc was finally joined by the Spider Riders who had spent two rounds squabbling (Animosity), but that ended up in a mess and the Dwarves won. 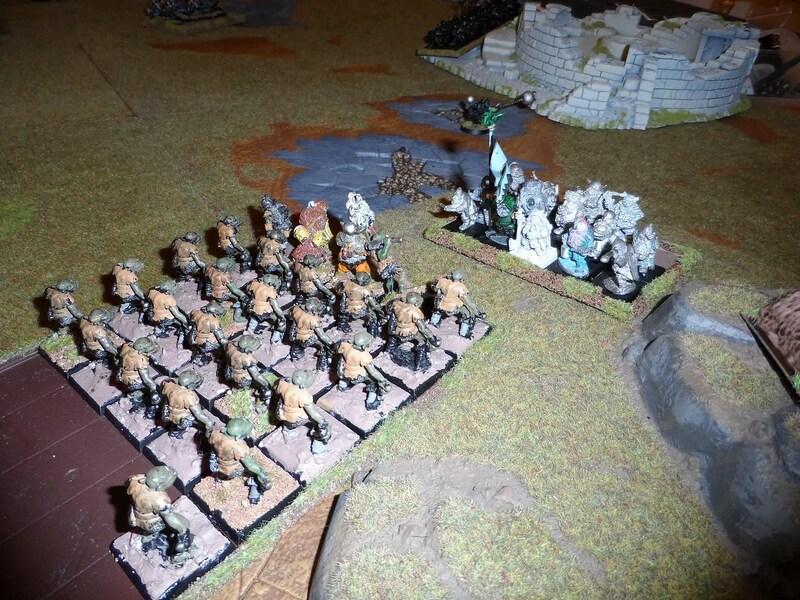 This left very few Orc or Goblin units left intact, but several Dwarf units intact. Eventually after 6 hours and 6 rounds of hard combat the Dwarves won. A clopse battle though that had started badly for me, and then swerved back to me. Haha, that was exactly what I did too! You two are on bread and water next time. I thought Gav had me on the ropes for the first few turns. I’m sticking to this Oldhammer army, and I have still not unleashed “El Mariarchi”…. Oh I have three Modem defeats to report yet – more photo editing is going on chez Carcosa. This was a game of two halves. Initially things went in my favour before Giles got the upper hand. So what went wrong for the orcs? I would suggest three things. Luck – lady luck was decidedly with the orcs/gobliins for the first three rounds or so, only to desert them in the second half of the battle. Man of the Match – was definitely the steam tank. 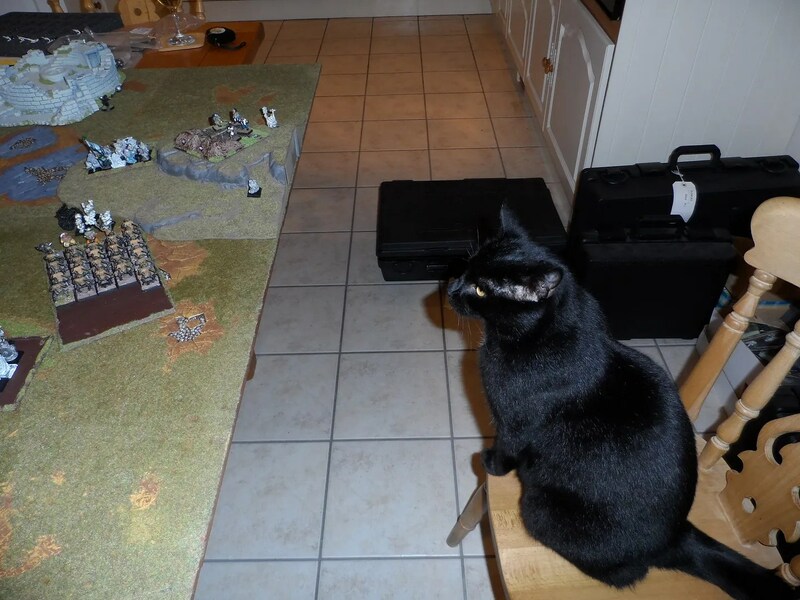 It demolished literally half my black orcs at first contact and routed them in the following round. I had no reply, or so I thought. It then went on to pull a handbrake turn of which the Duke boys of Hazard County would have been proud to do the same thing to the Harboths. 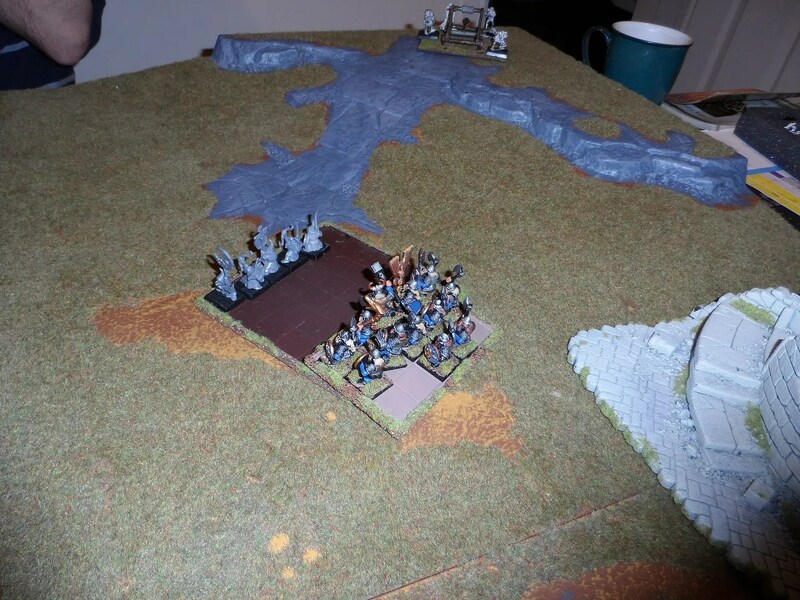 Combat – my plan was to get my units in to combat largely intact and I was pleased that this actually worked for the most part. But the dwarves proved hardy opponents meaning that once engaged in combat things just settled down to a war of attrition until a flank attack by one party or the other. I have no complaints and have learned a lot about facing dwarves. Giles effectively shut down the magic phase with his rune smiths. I might leave the trebuchet at home next time as it proved almost completely ineffective. I still find myself with no response to Giles’ use of Scouts to block early flanking moves and once again I lost my light cavalry cheaply early on. Either that or they spent a third of the battle sitting in a wood squabbling! I am getting more experienced and am now at a stage where I can at least give Giles a good run for his money. One day I might even win! A good fun game and look forward to the next one. Thanks Giles.